Rise Sir Knight & Prepare for Battle! 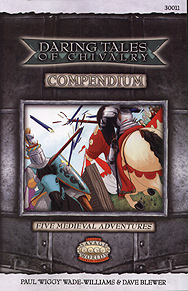 Daring Tales of Chivalry Compendium is a set of five Savage Worlds adventures set in a medieval England full of mystery and where legends come to life. When two monks ask Sir David of Winchester and his entourage for help it seems like a righteous quest is beginning. But the monks of Muchelney Abbey lead a colourful and interesting life, and their problem is no earthly one. To save the monks physical bodies, and maybe their eternal souls, the knights must deal with a divine servant who guards a holy weapon and a French raiding party attacking southern England before facing down the true monster. Sir David and his illustrious band of heroic fighters enter the city of Wells. It seems the whole county of Somerset has come out to greet the Knights and Men-at-Arms who are soon to meet each other on the tournament field. However, unknown to the heroes is that someone is going to be murdered! The heroes have to solve the mystery and figure out the murderer in this medieval who-dun-it! Our heroic retinue has arrived in the marshy land of East Anglia. It seems to be gripped by a permanent winter that has made the local marsh people turn to the pagan gods hoping they can return the true order of the seasons. All is not what it seems as our heroes discover an oasis of good weather keeping the Danbury lands in permanent summer. They soon discover an ancient devilish pact with an ancient folk called the Fae has secured this false summer. Can they uncover the truth of the Fae and more importantly break the curse? Castle Fairstone puts the heroes between two feuding families locked in a castle. Soon they discover they aren't alone, and what starts as a tense negotiation soon becomes a desperate fight for survival against strange unknown forces. In The Madness of Sir Stephen the heroes are asked to investigate the strange affliction of a trusted lord. What follows will pitch them against brigands and a creature of legend which has haunted the land for centuries.